^ a b c d e f g h i j k l m n "Falcon Heavy". SpaceX. November 16, 2012. Retrieved April 5, 2017. ^ a b c d e Harwood, William (February 6, 2018). "SpaceX Falcon Heavy launch puts on spectacular show in maiden flight". CBS News. Retrieved February 6, 2018. ^ "Falcon 9". SpaceX. November 16, 2012. Archived from the original on May 1, 2013. Retrieved September 29, 2013. ^ Jeff Foust (September 29, 2017). "Musk unveils revised version of giant interplanetary launch system". SpaceNews. Retrieved May 3, 2018. ^ Musk, Elon (December 20, 2005). "June 2005 through September 2005 Update". SpaceX. Retrieved June 24, 2017. ^ "Elon Musk's Tesla overshot Mars' orbit, but it won't reach the asteroid belt as claimed". The Verge. Retrieved February 27, 2018. ^ "Capabilities & Services". SpaceX. November 28, 2012. Retrieved August 21, 2017. ^ Elon Musk [@elonmusk] (February 12, 2018). "Side boosters landing on droneships & center expended is only ~10% performance penalty vs fully expended. Cost is only slightly higher than an expended F9, so around $95M" (Tweet) – via Twitter. ^ Elon Musk (September 29, 2017). Becoming a Multiplanet Species (video). 68th annual meeting of the International Astronautical Congress in Adelaide, Australia: SpaceX. Retrieved December 17, 2018 – via YouTube. ^ "Capabilities and Services". November 28, 2012. Archived from the original on October 7, 2013. Retrieved September 28, 2013. . Retrieved March 25, 2014. ^ "SpaceX set to launch massive satellite on July 2nd: 3 flights in 9 days". www.teslarati.com. June 27, 2017. ^ FOX. "Launch of SpaceX Falcon Heavy rocket pushed to Thursday". WOFL. Retrieved April 11, 2019. ^ Clark, Stephen (April 11, 2019). "SpaceX's Falcon Heavy successful in commercial debut – Spaceflight Now". Spaceflight Now. Retrieved April 12, 2019. ^ a b Foust, Jeff (December 19, 2018). "NASA looking to launch delayed space science missions in early 2019". Space News. Retrieved February 8, 2018. 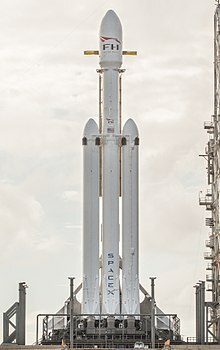 ^ a b "Falcon Heavy and Starlink headline SpaceX's upcoming manifest – NASASpaceFlight.com". Retrieved April 2, 2019. ^ a b "Oculus-ASR". Gunter's Space Page. Retrieved March 15, 2016. ^ "Viasat, SpaceX Enter Contract for a Future ViaSat-3 Satellite Launch | Viasat". www.viasat.com. Retrieved October 25, 2018. ^ a b Henry, Caleb (June 1, 2018). "Arabsat Falcon Heavy mission slated for December–January timeframe". SpaceNews. Retrieved June 2, 2018. ^ "Falcon 9". SpaceX. November 16, 2012. Archived from the original on August 5, 2014. Retrieved August 30, 2016. ^ Davis, Jason (May 11, 2018). "LightSail 2 launch slips to Fall". The Planetary Society. Retrieved May 13, 2018.